I won’t go so far as to say that director Zack Snyder's Man of Steel was a complete failure. There’s a good movie in here somewhere. There really is. But it’s a deeply flawed film, mostly due to David Goyer’s script. The flow, structure - whatever you wanna call it - of the story. It just. Didn’t. Work. The many, many (many) flashbacks constantly pulled me out of the narrative. It got to the point where it was like, still? We’re still doing flashbacks? So the film just couldn’t seem to get going. I found myself waiting for a decent action sequence. And not mindless action, either. Just something super, something worthy of the Man of Steel. The movie begins on Krypton, Superman’s birthplace. They literally show him being born. Which is kind of an awkward way to start the movie if you ask me. We get a good look at Krypton, more so than I was expecting. Actually, was anyone expecting Krypton like this? It was pretty crazy (I literally wrote “Krypton = zany” in my notes). After the birth of Kal-El (as he’s known to his parents), the first natural birth on Krypton in some time, his father Jor-El (Russell Crowe) tries to talk sense into the planet’s leaders. Yes, Krypton is dying, and at the hands of its own people. General Zod (Michael Shannon) and his forces bust up into Jor-El’s meeting and take control. Jor-El manages to escape, however, and is able to rescue his son by jettisoning him into space on a course towards Earth. Zod manages to kill Jor-El, but he and his forces are captured and banished to the “Phantom Zone” via a black hole device. We then flash forward to meet Clark Kent (Henry Cavill) on modern day Earth. I actually had no idea what was happening on Krypton. I know that the planet was essentially self destructing and that General Zod was trying to take over. But it looked like all-out war on the planet. I’m assuming it was General Zod’s followers fighting with the Kryptonian authorities but I just wasn’t sure (and it wouldn’t be the last time I was confused about what was happening in the story and how). Don’t get me wrong, I enjoyed the Krypton sequence and I appreciate that the filmmakers went that in depth. I just wasn’t expecting it. Other than the general flow of the film, I have to criticize the dialogue. The first school sequence - where Clark winds up hiding in a broom closet - was just kind of awkward. The “The world’s too big, mom,” dialogue worked in the trailer but here it’s just awkward. Who talks like that? There’s a lot of crummy dialogue in the film. In fact, let me just get all my dialogue qualms out of the way here. Lois Lane (Amy Adams), when shown a small room she has to stay in at one point in the film says: “What if I have to tinkle?” Later on she refers to the fact that she's a Pulitzer Prize winning journalist. We get it. She’s a good reporter. At one point late in the film, Superman confronts Zod with the line (I’m paraphrasing) “You’re a monster and I'm going to stop you.” It seems like somebody put that line in the script as filler and forgot to rewrite it. Another line, perhaps the worst in the film, spoken by General Zod (again, paraphrasing): “There's only one way this is going to end...either you die or I do.” Isn’t that two ways? Another problem that I had with the film was the squandered opportunities. That oil rig sequence was very short and the scene where Clark saves the school bus could have been more epic (I mean, couldn't they show him pushing the bus out of the water a little bit?). The tornado scene later in the film - which could have been a cool action sequence if done right - simply kills Jonathan Kent (in the most thoughtless way possible). There were a few outright strange elements in the film. One was that it didn’t seem to want to call Superman Superman. It seemed like the third act or so before someone actually said his name. And what was with the product placement throughout the film? Nikon, U-Haul, Sears, 7-Eleven. Superman fought a villain in an IHOP for Zod’s sake. The fists finally start flying in the third act when General Zod and his crew (having escaped the Phantom Zone due to Krypton’s destruction) find Superman on Earth after years of searching. The fight scenes were cool but at the end of the day, it’s nothing we haven’t seen before. And it isn’t long before we’re on to the next sequence, which finds Superman and the military trying to banish General Zod and his forces back to the Phantom Zone before they can terraform Earth with a Kryptonian World Engine. The military’s plan? Create a black hole in the middle of Metropolis using the ship that brought Superman to Earth and hope for the best. I actually wondered if Metropolis was destroyed at the end of that segment. The film culminates with a big brawl between Superman and Zod after our hero and the military stop the villain's World Engine. I didn’t like how the Superman/General Zod fight played out. I thought that it was two unstoppable supermen fighting each other, but Superman just ended up snapping Zod’s neck. Seriously? That’s it? And it raises a big question. Batman’s one rule is that he won’t kill. What does that say about Superman? Where does that leave us in the modern age where Batman - who has always been viewed as the darker of the two - is the more principled hero and the one who won’t kill? And we’re talking about the Batman featured in the films of David Goyer and Man of Steel producer Christopher Nolan here, so it’s not like there isn’t a basis for comparison. One of the best things about the film was the talent from some of the leading actors. Russell Crowe was great throughout the film as Jor-El and Michael Shannon was just right as the menacing Zod. Henry Cavill really owned the role of Superman and I’m excited to see what he does with it in future installments (I know he’s a great actor because they showed not one, not two but THREE scenes of him screaming intensely into the camera). Kevin Costner really nailed the role of Jonathan Kent and I'm genuinely disappointed about how the film treated the character. Zack Snyder really knows how to make a film look great. The imagery of Clark and Lois in the desert and Clark’s weird skulls/doomsday dream looked particularly great. The production design and the costumes were fantastic, as was Hans Zimmer’s score. Expect some Oscar nominations there. A friend of mine made the observation that Batman Begins (the Man of Steel of The Dark Knight trilogy) was quite inferior to its sequels and I really hope that’s the case here. I really want to like this series. I liked it a bit more than you did, but I basically agree with everything you wrote. I didn't find the dialogue that bad though, I just think the story structure didn't serve it well. Especially that scene with his mom in the school. If they had built up a backstory behind it, then it would have been more effective. The way they just plopped it in made it feel a bit awkward (although I still got all mushy, I'm a sucker for these things). Thanks for reading, Squasher. I don't know, I still think the dialogue is terrible but you're right, the story didn't do it any favors. Something I made a note of but that I didn't really talk about was that I was not a fan of Diane Lane as Clark's mom. And I'm usually fine with her. I enjoyed it enough but I can't fault most of your reasoning here. let's hope you and your friend are right about the sequels. Thanks for reading, Pete. I'm hoping this movie is just suffering from that origin story syndrome where the film has to struggle to tell a story that's already been told. Hopefully they'll tell a great new story in the sequels and not have to deal with flashbacks. 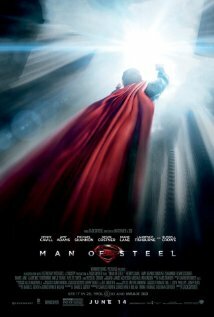 An unceasing torrent of CGI explosions, destruction and superhuman Kryptonian combat, Man of Steel is more bang for your summer movie buck, but would there was magic and spark to go along with all that muscle.